Wasps are attracted to human food, especially sugary drinks, and once one wasp discovers a food source, it will communicate the location to other wasps in the nest. The City of Regina has a few tips for homeowners who find wasps nesting in their yards and want to reduce the chances of getting stung. Russell Eirich, Regina's manager of forestry, pest control and horticulture, says wasps can be distinguished from bees by their smooth bodies and foldable wings, where bees have fuzzy bodies. Wasps are more aggressive than bees and can sting multiple times. Wasps can be beneficial in a backyard as they eat other insects — including garden pests such as aphids — but as summer turns to fall they become more aggressive, Eirich said. That's because their nests are growing and they're struggling to feed a crowd. They're attracted to human food, especially sugary drinks, and once a wasp discovers a food source, it will communicate the location to other wasps in the nest. Eirich said homeowners can help keep wasps away from picnics and backyard barbecues by keeping food covered and putting it away immediately when you're done eating. Rinse away any drink spills immediately with water. Also keep garbage bags tied and the lids in place on garbage cans. 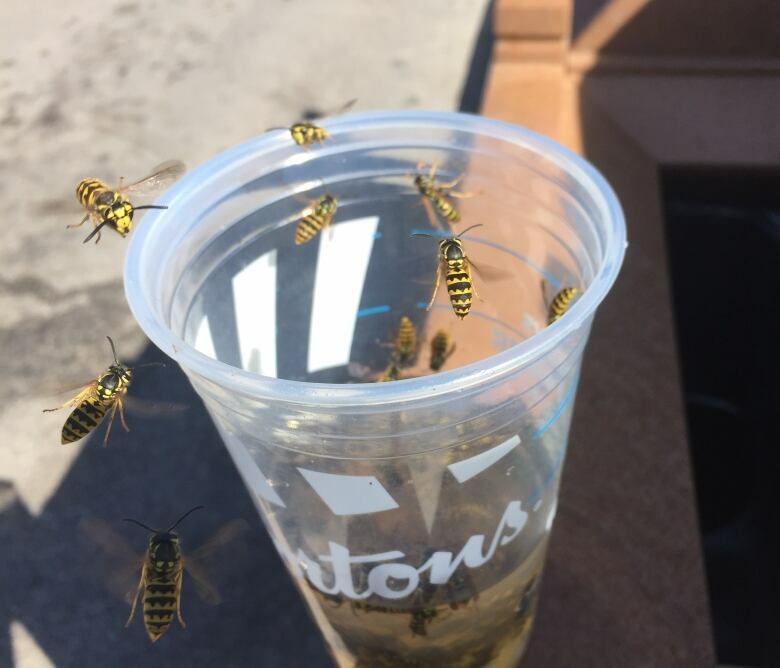 Wasp traps can be baited with sugary drinks and Eirich says once the wasps are trapped, submerge the trap in water to drown the insects. Wasp nests can be treated with sprays, or dust for underground nests. If you plan on treating a nest yourself, Eirich recommends choosing the coolest part of the day and wearing long-sleeves for protection. "I would do a nest in my own yard at five o'clock in the morning just because they're slower, they're a little more sluggish and they're not as aggressive, and it's safer for me." He said last year, city staff treated a total of 28 wasp nests on city property. In the first week of wasp work this year, they have treated 10.